These are some of the experimental ideas Paul has for Black and White Inks. Here you will be able to purchase some of his latest developments before they appear on our site. These products are sold without warranty or any promise of performance. They are strictly experimental. Use at your own risk. These bases and inks are used in Paul's open source inksets. We provide the bases mixed to Paul's specifications for those users that either do not want to purchase the individual ingredients in bulk or cannot readily obtain the components. These bases are not the same as our MIS bases, and thus do not always have the same properties and should not be considered interchangeable. As these bases are an open source product for customers to produce custom inksets we can only guarantee that the base is mixed to Paul's specification and cannot offer support for the actual mixing or use of the inks. These bases are not returnable as they are considered a specialy product. We hope this helps you get started. The process is a learning experience. We will be glad to post anything you learn that you would like to share with others. Just drop us an email. You will be surprised at the results you can achieve in a short period of time. Good Luck on creating the perfect black ink set. 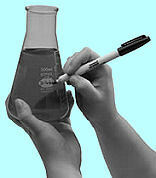 Below we offer the clear Base Stock and a few Black inks for blending Black & White inks. Do not use Eboni as the Black Ink for blending with the amber UC base.